The violent fallout from a decision by city officials in Charlottesville to remove a statue of Robert E. Lee from a city park has energized efforts to eliminate Confederate symbols across the nation. One state at the center of the drive is Kentucky, a Civil War border state where the man being held on suspicion of second-degree murder in the Virginia violence was raised. James Fields Jr., accused of slamming his car into counter-protesters near a white nationalist rally, went to high school about 80 miles northwest of Louisville. Carol Kraemer, a co-founder of the Louisville chapter of SURJ, Showing Up for Racial Justice, helped organize the rally. She told the crowd that symbols of slavery should not be celebrated at a time when black people are being killed by police, Muslims are facing attack and immigrants are being deported. Meanwhile, at a rally 75 miles to the east in Lexington, Mayor Jim Gray drew cheers for his decision to remove two Confederate statues from public grounds. And the Kentucky chapter of the NAACP said it wants a statue of Confederate President Jefferson Davis removed from the state Capitol Rotunda. Protesters in North Carolina took a more direct approach Monday, toppling a statue of a Confederate soldier near the courthouse in downtown Durham. Video from the scene shows protesters using a strap to pull down the statue, with some then kicking it as others cheered. 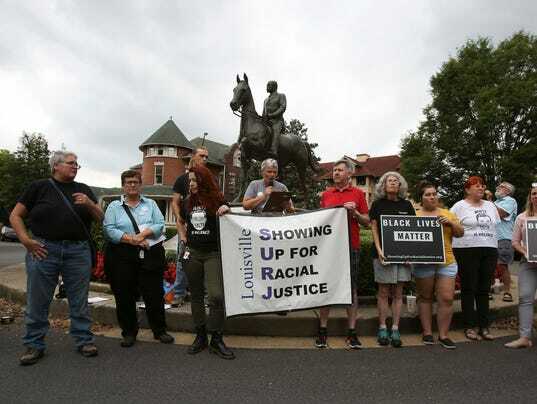 In Nashville, protesters demanded that a bust of Nathan Bedford Forrest, a Confederate officer who later helped lead the KKK, be removed from the state Capitol. Not all Confederate statuary is in the South — there are more than 700 across at least 31 states. Kentucky, Missouri, West Virginia and Maryland were all border states aligned with the Union that also provided plenty of Confederate soldiers, and have monuments that reflect the southern sympathies. Union states such as Massachusetts, Iowa and Pennsylvania also have a few monuments, along with states that in 1861 were territories, such as Montana, Arizona and Oklahoma. In Maryland, Baltimore Mayor Catherine Pugh on Monday pledged to remove Confederates statues, saying they could be moved to Confederate military cemeteries or possibly sent to universities that have expressed interest. Council Brandon Scott, however, told The Baltimore Sun the statues should be destroyed. Bacon reports for USA TODAY, Warren for the Louisville Courier-Journal. Contributing: Mary Bowerman and Rick Hampson, USA TODAY; Jordan Buie, The Tennessean in Nashville.